liveartwork DVD aims to present documentation of live performances of contemporary live and performance art from aound the world. It hopes to introduce an inter-national audience to new artists and new work. This inaugural issue is loosely themed around presenting work that has been performed in Berlin over the past year. The selection represents an internationally diverse range of artists with equally diverse approaches to live art. Issue 1 features clips from eight artists and has a total running time of about 80 minutes. To get a copy of liveartwork DVD issue 1 click on the 'order' link above. For over ten years US artist Jamie McMurry has been creating original performance art works and presenting them internationally. He co-founded the Rite! Performance Art Troupe and Powderkeg Contemporary Performance and has also organized several major performance art exhibitions in Seattle, Los Angeles and Boston including the Full Nelson Festival. He is currently based in Los Angeles. 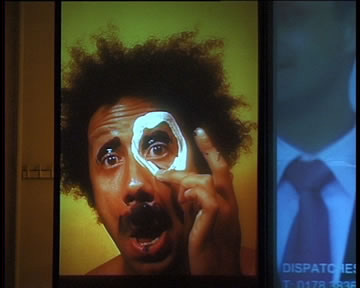 Autobiographical in its foundation, McMurry's work also deal with nationalist identity and the desire for conformity. Although physical intensity and aggression are common frames for his actions, the pain of the work is circumstantial - much as it is in everyday life. 52 Pick Up draws attention to our notions of family and community. In the moment of any given exchange, in this case a performance, the possibility for a communication takes place that is unique to that particular group of individuals present. Re-telling empathetical traumas, consuming their hair, burning and erasing mine, having people write the names of their parents on the floor and the subsequent erasing of them with water and trace drops of blood. Means of sharing our identities as individuals and as one, to intensify the exchange that is taking place. Very little English spoken text. Dariusz Kostyra - Performance Art Joke Performer Stammtisch, Kathedrale, Berlin, May 2005 Based in Berlin, Dariusz Kostyra is a member of the performance groups Batterie:Kongres and Showcase Beat Le Mot. As a solo artist he is currently working on a series of performances called It's all Very Well for You to Laugh, where he uses jokes like the minstrels used poems and songs in medieval Europe. As Dariusz says "its not the clothes that you wear, but the jokes that you laugh at that tells who you are." 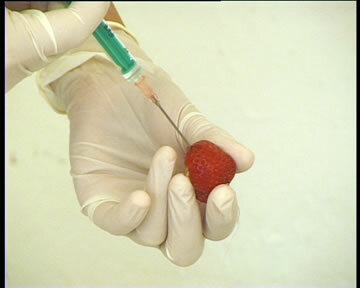 The video clip shows a short performance from this series, presented as in 'interlude' during a friend's performance, at the 'Performer Stammtisch' - a monthly meeting of performance artists based in Berlin. 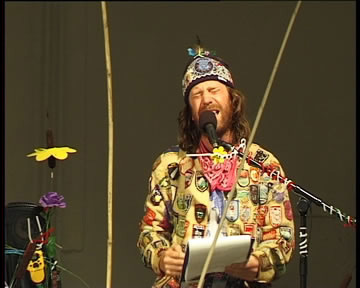 British artists Gregg Whelan and Gary Winters formed Lone Twin in 1997 to work with performance dealing with the ideas of place, context and travel. They have created a body of work which has been shown across Europe, North America and Australia. Committed to creating entertaining and hopeful performances that remain rewarding to a wide audience, their work ranges from context-specific works lasting many days to gallery, studio and stage performances. SledgeHammer Songs evokes the mystery of the Medicine Show, the poetry of Pub Rock, the loneliness of the European Busker and the drownings of The Great and The Cursed. Drawing on the Spectacular Social Practices of Crop Growing, Morris Dancing, CD Burning, Cloud Taming, Weather Becoming and Justin Timberlaking the evenings’ activities exhaust, exasperate and evaporate all those willing to dance to The Calling. SledgeHammer Songs was commissioned by and premiered at Kunstlerhaus Mousonturm, Frankfurt and supported by an Arts Council of England International Fellowship Award. 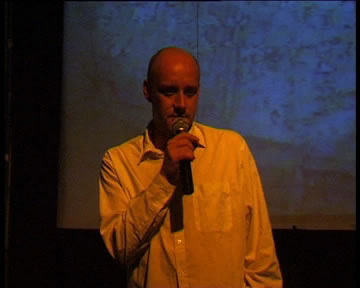 London based artist Robin Deacon has been active as a performer, writer and filmmaker for over ten years. Working primarily in the area of spoken text, much of his work is characterised by a humorous and satirical approach to his subject matter. Most recently his work has explored the idea of topical and location specific performance with the application of journalistic and documentary approaches to devising processes. Dispatches was the culmination of an Arts Council of England funded residency at the Sophiensaele Theatre in Berlin. This performance saw Robin taking on the role of a ‘foreign correspondent’ covering the German election. The particular focus was on media portrayals of then candidate Angela Merkel. The performance also featured crass generalisations regarding German people and their customs. Based in Hamburg, Germany, Showcase Beat Le Mot are an international performance, theatre and art production group, who, since 1997, have produced and staged shows in venues and festivals throughout Germany and Europe. As a group they work on all levels of a production: organisation, dramaturgy, text, music, space design, light design, acting, directing, cooking and mixing drinks. Their work integrates pop music, sports, movies, comics, television and fine arts within a very personal context. With their performance series Gomune they attempt to find ways of staging the legendary Japanese manga comic series Lone Wolf with Cub by Kazuo Koike and Goseki Kojima, resulting in a highly economic, highly picturesque, and strictly non-psychological theatre language. The video clip consists of a montage of three ‘episodes’ from the series performed in Berlin and Dresden. Gomune is a Showcase Beat Le Mot production, in co-operation with Kampnagel, Hamburg and the Forum Freies Theater, Düsseldorf. Florian Feigl originally studied Applied Theatre Sciences at the Justus Liebig Unviersity in Gießen, Germany and was one of the founding members of the performance group Showcase Beat Le Mot. He currently lives in Berlin and as well as making his own, solo work, is involved in a number of performance projects including Wagner-Feigl-Festspiele with Otmar Wagner, Prodesse&Delectare with Jörn Burmester and the Hollywood Leather performance art group with Ellen Friis and Christopher Hewitt. Wet'n'Wild Revisited can be described as an alchemistic experiment, a performance about the process of the transformation of energy and thought and processes of circulation. Feigl begins the performance sitting with his back towards the audience as he accumulates a tense energy in his body. The subsequent actions in the performance can be seen as a ritualised release of this tension and energy resulting in a entropic cycle of self consumption and release. 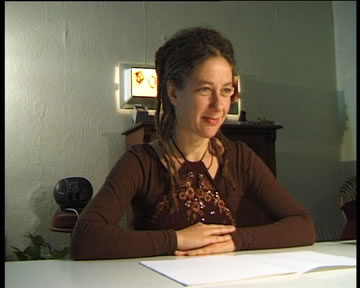 Eva Meyer-Keller lives in Berlin and works mainly with performance. Her work is versatile and she is often engaged upon several projects at one time. She also develops projects together with other people and is increasingly working with video. She is also a member of the electro-rock band Ochosa and has worked for groups such as Baktruppen, Jerome Bel, Christine De Smedt / les Ballets C de la B and others. In Death is Certain she uses a range of household appliances to explore a variety of ways of ‘killing’ a number of strawberries. The forms of death include drowning, hanging, poisoning, electrocution, flaying and many others. Through abstract demonstrations of these methods of massacre, the connection is made between the everyday objects of the kitchen and DIY toolbox and a private exploration of brutality. Liveartwork DVD presents a specially filmed video documentation made in the artist’s home. 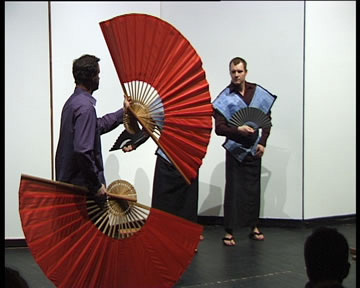 The full live version is normally made for about 40 spectators who are free to move around the performance space. Sylvie Cotton is a French Canadian multidisciplinary artist living and working in Montreal. She has studied literature, arts and museology. Her work, which includes installation/situation and performance, focuses on the relation between social and individual identities, and between public and private spheres. Her projects take place in the street or other public spaces, including galleries and festivals. She is an active member of the international performance art community and has presented her work at venues and festivals around the world. Being is in the Other is an ongoing project in which Sylvie continues to compile a comprehensive list of all the people she remembers being introduced to, starting from the beginning of her life up to the present time of the performance. The list takes the form of a book from which she reads during the performance. The video is of a special reading made without an audience, which was made a few days after a public performance at the ‘Performer Stammtisch’. The full performance is about 40 minutes long.